I think we can all agree that “account-based” is a leading contender for 2016’s phrase of the year. If you watched a webinar, read a blog post, or attended a conference and had account-based as your drinking word, you’d have a frequent flyer number at your local ER. Beneath the buzz, however, this one has some there there. There are two tides propelling the account-based movement. One, the number and diversity of people involved in purchasing decisions has changed. The “buyer” has become the “buying unit” and is quickly growing into the “buying battalion.” Just about any single sale process seems to require dozens of yeses and risks running aground in the face of a single no. Two, it is getting harder and harder to scale what worked in the past. Killed it at that BigCon tradeshow last year? Great! But doubling your spend next year won’t net you double the new logos. Same goes for PPC, social advertising, PR, etc. Death, taxes, and diminishing returns are the immutable laws of our world. I call that getting to $100M the hard way. But there’s an easier way: account-based revenue. I love all the excitement around the account-based movement. But I’m concerned that in the mad dash, we’re skipping over a few things. I can declare myself a marathoner, but until I cross the finish line, words are just that. I’ve spoken with companies that have $15K, $50K, and $200K average selling prices. They all consider themselves account-based. That should alarm you. Selling to companies, not individual prospects isn’t account-based anything. Prospecting more than one person in an account? Fantastic! That’s account-centric selling and was innovative in 2004. I’m willing to bet that the majority of you have been thinking this way for years. Not to be confusing, but account-centric and account-based strategies do share similarities in that they both think in terms of accounts, involve account teams, and plays/planning. But that is where the story ends. Account-centric tactics are a one-to-many play. One general budget and one dedicated set of sales resources focused on many accounts. With account-based, you need to think in terms of resource allocation per account. As Jon Miller said, that means time, headcount and budget. Unlike account-centric, account-based additionally requires a cross-functional team that often extends beyond the sales and marketing organizations. Where do you want your revenue to come from? 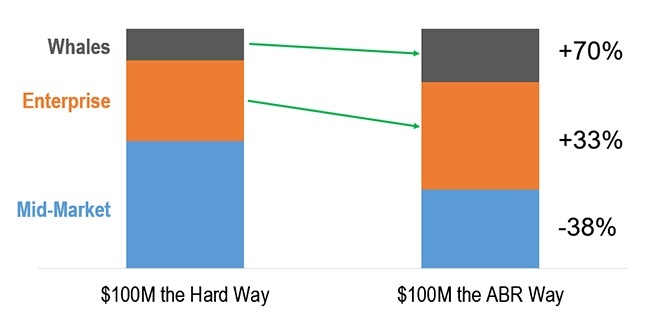 Returning to the client I mentioned earlier, I asked them: how do you want to get to $100M? Option A requires a high volume of mid-market deals. Option B shifts some of those resources and focuses them upstream and account-based. I asked, do you want to get $100M the hard way or the ABR way? Rebalancing with account-based revenue required 500 fewer new logos from the mid-market. We also estimated it will be 14-18% cheaper (sales & marketing operating expenses). As with all innovative movements, there will be winners and losers in this game. The losers will struggle. They’ll think having SDRs call many contacts in a single account gets the job done. They’ll execute traditional demand generation strategies and measure success in traditional ways. They will live in the land of SALs and MQLs, never get to the promised land, and fail to understand why. “Here’s the email template that got us into 5 of the Fortune 500,” said no one ever. The winners will measure their success in more whales, larger average deal size, and significantly more revenue. I'd love to hear where you are on your account-based journey. Please share in the comments below.